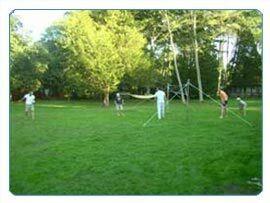 Relax or play badminton in our own park, enjoy the wide unspoilt beaches of the Atlantic or improve your rowing skills on the nearby beautiful lake at Soustons. 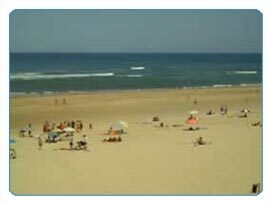 Surf the ocean waves, turn the pedals on the never ending quiet roads of Aquitaine and then collapse in a hammock with a glass of French wine... just long enough until you find the strength to follow the enticing aromas coming from the barbeque or the big plancha. This is where the expression "like God in France" started. Choose between an exhilarating sporting holiday for top athletes or a relaxed time with your family. You can even combine the two. 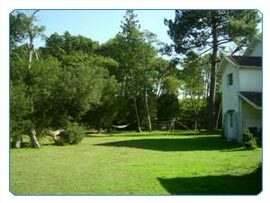 Our house is set in a park of 6,000 square metres, situated in the quiet green neighbourhood of “Pitéou” in our beautiful village of 1,500 inhabitants. Enjoy your holiday away from the tourists, but still within 200m of a supermarket and 500m from the centre of the village. Relax at night to the sounds of the waves from the nearby Atlantic ocean. Biarritz, the Basque country and the Pyrenees are in the vicinity. We offer competition cycling, rowing, surfing, triathlon and other sports. Click on the photos or the links for further information and to inspire your imagination.